Zaslawye or Zaslaŭje (Belarusian: Засла́ўе, [zaˈsɫau̯je]; Russian: Заславль; Polish: Zasław; Lithuanian: Zaslavlis) is a historic city in Minsk Province of Belarus, 20 kilometres northwest of Minsk. In 2009 its population was 14,400. According to chronicles, Zaslawye was founded in 985 by Vladimir the Great who sent his wife Rogneda to live here with their son Izyaslav of Polotsk, the founder of the princely house of Polatsk. It is mentioned in historical writings as Izyaslavl. The town's current name derives from this name. In the early Middle Age the town was centre of the Duchy of Zaslawye. In the 11th century, the town was heavily fortified; much of its territory has been designated an archaeological reservation. There is also a modern outdoor statue of Rogneda and Izyaslav on the grounds. During the period of Reformation, the town was a nest for followers of Calvinism and Socinianism. This district center was under German occupation from 1941 to 1944. In 1939, Jews comprised 9% of the town’s total population, numbering 248 people. In October 1941, the Germans gathered 100 Jews of the city in a ghetto which was a building formerly occupied by Soviet border guards. It was forbidden to go outside, they didn’t received food. The ghetto was surrounded by a fence and was supervised day and night. On September 26 and 27, 1941, all the Jewish males were killed, at least 20 people in total, 12 of them burned in the ghetto building. On September 29, around 100 Jews, mostly women, children, and elderly people, were taken on horse carts out of the ghetto under the pretext of future resettlement to Minsk. They were all shot in a pit in the forest near the village of Sloboda. For a month following the liquidation of the ghetto, 35 Jewish women were kept in one of the houses on Bazarnaya Street. They were used for different kinds of forced labor until they were all shot on October 29, 1941. Situated in north-western suburb of Minsk, is part of its urban area and one of its main towns also with Fanipol and Machulishi. 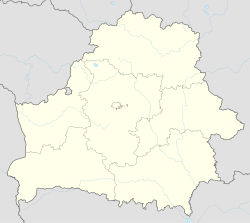 Considering that the Belarusian capital, seat of Minsk Raion, is administratively separated from it, Zaslawye is the most populated settlement of the proper raion. 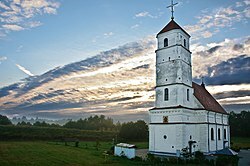 All historical attractions of Zaslaŭje are situated in the downtown not far from the Belarus Railway Station. The most interesting of them are the Zamechek (Castle) archaeological site of the Zaslaŭje town of the 10 – 12th centuries, the Val Site that includes town ramparts and the fortified Savior Transfiguration Church (primary Calvinist church which was built from 1577 onward and is still in fair preservation), the Phara St Mary Church of the 18th century, a small skansen of a traditional wooden tavern, smithy, storehouse and steam mill. Wikimedia Commons has media related to Zaslawye. This page was last edited on 11 March 2018, at 23:02 (UTC).